It’s a beautiful day in Anchuca’s historic neighborhood. These arial videos by Tom Roark give us a bird’s-eye view of Anchuca, in the heart of Old Town Vicksburg, which is just blocks from the Old Courthouse Museum and minutes from downtown and the National Military Park. Summertime…and the living is easy! Anchuca is getting in shape for summer. 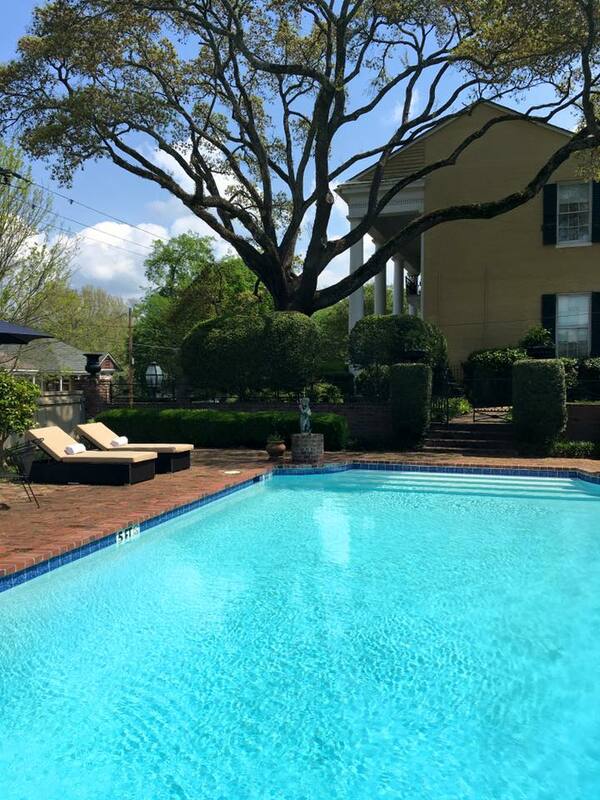 Anchuca Historic Mansion & Inn in Vicksburg, Miss., is the perfect summer weekend getaway or local “staycation” spot. Come relax by the pool with a book and a cold beverage. Enjoy the many amenities Anchuca has to offer and end the day with a delicious meal in our Garden Room. Call today and we’ll save your spot! 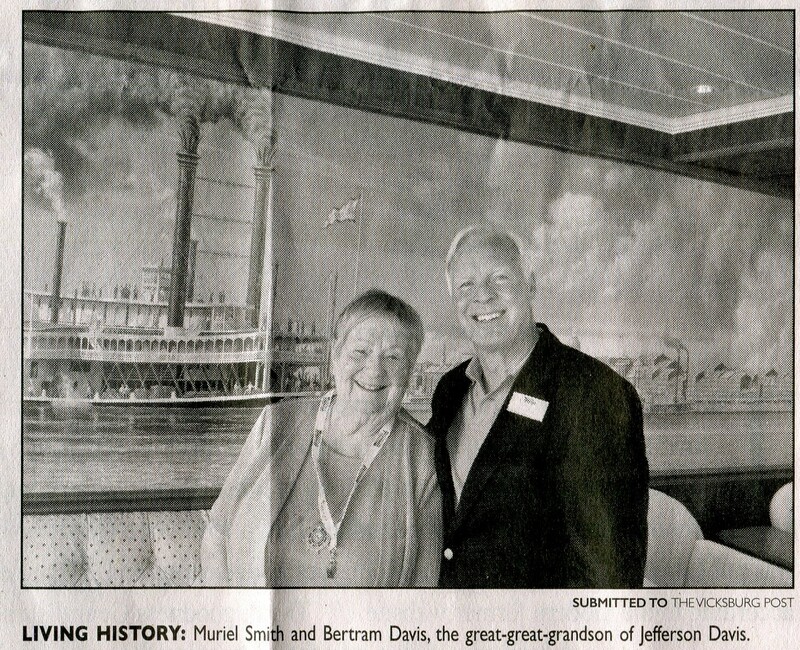 Every day aboard the America Cruise Line’s America was spectacular, especially for those of us who were thrilled to be educated by the great great grandson of Confederate President Jefferson Davis as a shipmate on this boat trip up the Mississippi through Civil War territory. An added bonus was the dual entertainment of Laura and Bill Wiemuth who know how to combine musical talent, even a bit of magic, with a vast knowledge of the Mighty Mississippi. Afternoon talks by both Bertram Davis and Bill and evening music and laughter headed by Laura and Bill, coupled with fascinating tours of museums, towns, and battlefields make for an indescribably wonderful cruise. But if there is a single day to be identified as a highlight of the trip, it was the spontaneous day we spent walking around Vicksburg with Bertram and Carol Davis and a close friend of theirs, Tom Pharr. Bertram explained the trip was ‘an extra,’ being tried by the cruise line to see if people would like it and whether it should be incorporated on future trips. I give that suggestion an A plus, and then some! If there are any complaints at all, it’s that the Civil War themed cruise was not long enough! 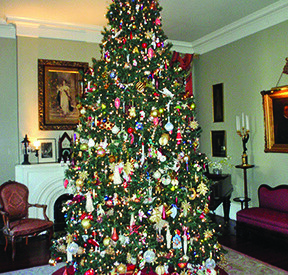 The 18 hour stay in Vicksburg, Mississippi simply doesn’t allow enough time to take in all the history of the battlefield and the siege of the city, the beauty of the area, the museums that abound about everything from Coca Cola to the USS Cairo, the first ironclad battleship that was sunk during the war. Or Anchuca, a magnificent mansion with a wonderful owner. We capitalized on the Davis/Pharr friendship. Pharr is an equally friendly historian and a Vicksburg native who owns Anchuca and a couple of other residences in Vicksburg. Couple this friendship with the cruise line’s enthusiasm for introducing innovative programs to see if cruise goers would enjoy something out of the ordinary, and the walking tour was a huge bonus. After an incredible morning talk about the Steamboat Sultana given by Wiemuth, and a several hour visit to the battlefield, we accepted the invitation to take the short walk to one of Tom’s houses, Anchuca, a luxurious and comfortable antebellum home, now restaurant and B&B, and enjoy tea in the drawing room. The home couldn’t be named more aptly…. 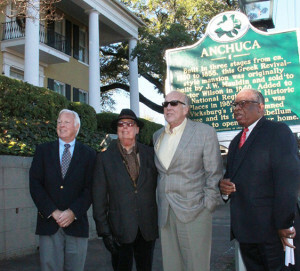 Anchuca is a Choctaw word meaning happy home. During tea, we were formally introduced to Tom, who immediately launched into a spirited explanation on the history of the mansion where he had worked during his high school years when it was a B&B as well as a tour guide and porter. Though he always dreamed of owning a home like this, Tim left Vicksburg for an education and career in architectural design but never quite forgot the teen age dream and the first architectural design he fell in love with. So 15 years ago when it became available, Tom decided to chuck his architectural work, return to his birthplace and buy Anchuca. 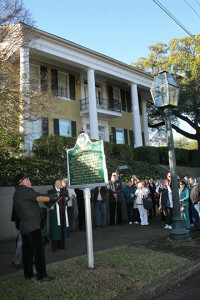 Today, this Greek revival landmark, on the National Register of Historic Places, is one of the most historic homes on the River, enjoys a reputation for being one of the best restaurants and B&Bs in the area, and is beautifully furnished with great antiques and art. We also learned the friendship between Tom and Bertram was more or less meant to be. While these two historians are 21st century friends, the 19th century owners and Jefferson Davis’ older brother. Joseph, were also apparently friends; Joseph was living here at the time of his death and the Confederate President himself had given talks from the front balcony, to the devastated people of Vicksburg after the siege. It’s a very small world even over the centuries. After tea, conversation, a tour of the mansion and the promise of more to come, we climbed further up the hill from Anchuca and the levee, all the while Tom regaling the dozen or so of us walkers with tales about Vicksburg and what made it great. He pointed out the Episcopal Church in the next block where daily services were conducted during the siege to assuage the grief of the residents, only to have the present day pastor, the Rev. Sam Godfrey, come out to greet us and open the doors to invite us in for a brief rest and more history about this still very active church and community. out to say hello and welcome. 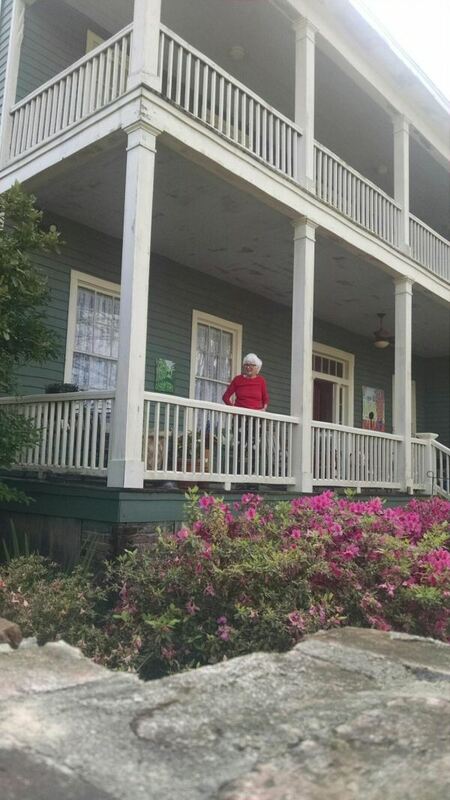 Regretfully, because of time constraints, we had to turn down the cheery invitation of the charming nonagenarian who came out on her back porch to say hello and invite us in to her antebellum home for yet another cup of tea. There’s no doubt about it, Southerners are a downright friendly and outgoing people! 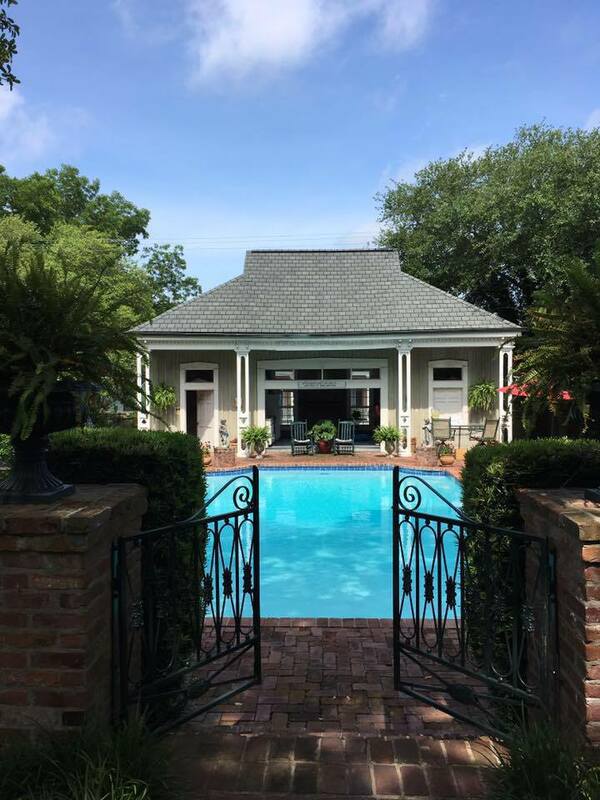 One more stop before heading back to the boat was at the home where Tom now lives, another antebellum beauty with fascinating architecture, amazing porches, and a wonderful blend of historic design and modern convenience. A highlight here is an upstairs office where the walls are plastered with this very dynamic architectural designer’s drawings of some of the many homes he has helped restore to their 19th century grandeur. 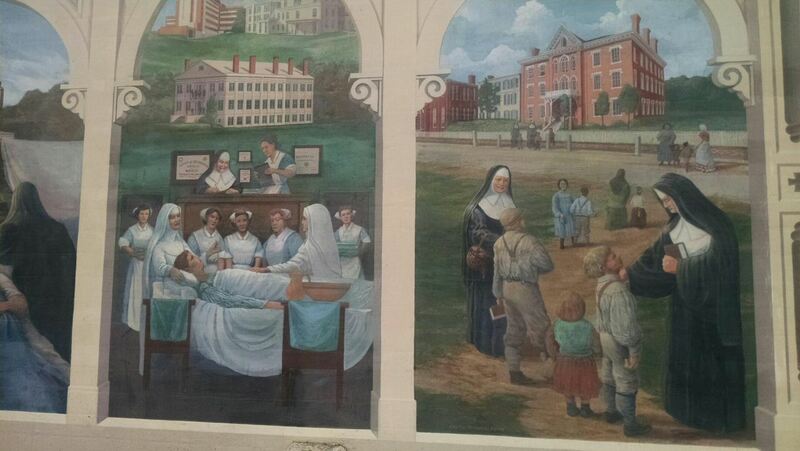 Heading back to the levee, we had enough time to review some of the spectacular wall painted by local artists and depicting the history of Vicksburg from when the Sisters of Mercy had a mission there through Theodore Roosevelt’s famous bear hunting expedition and many other sites that helped make Vicksburg the spectacular city it is today. Not as attractive, but perhaps an even larger part of the city’s history, is the levee wall with the markings of how high the river rose during specific storms and hurricanes. Vicksburg survived the Civil War, fought off Northern forces for many days, swallowed hard and overcame the devastation of its 47 day siege that marked the turning point of a war that should never have happened, and today can hold its head high and be proud of its history, beauty, strength, and the people who have made it all happen. Come join us for dinner at Café Anchuca! Here is tonight’s menu! Our signature Salmon is absolutely fabulous! It’s Riverfest Weekend in Vicksburg! Just imagine…sitting down to a wonderful meal, in a beautiful setting, with gracious servers, and nothing to clean up afterward (except for the finishing touches of a delicious dessert). Ahhh! Now, that’s something I could get used to. And, what a great way to spend time with family and friends! Why not start this tradition with Sunday Brunch at Anchuca Historic Mansion & Inn? Brunch is served each Sunday from 11:00 a.m. – 2:00 p.m. Please call us at 601.661.0111 for reservations. Our tree trimming marathon last week was a big success. As Mom always says, “I believe this is the prettiest Christmas tree we’ve ever had.” You’ve got to come sit in Anchuca’s ladies parlor and enjoy the fruits of our labor. Many thanks to Mom and Aunt Ann for trimming the tree. We have a delicious brunch planned for Sunday, featuring Rosemary Baby Backs with brandy apple sauce and a delicious Autumn Salad with Chicken, granny smith apples, mandarin oranges, cranberries, honey spiced walnuts, crumbled goat cheese served on a bed of mixed greens with spinach and our balsamic vinaigrette. Our Veggie Plate features saffron & wild rice medley, black eyed peas & red beans, fresh cabbage, and a cup of Asparagus bisque. Quiche Lorraine, Seafood Gumbo, and Steak & Eggs Benedict round out our menu for Sunday.